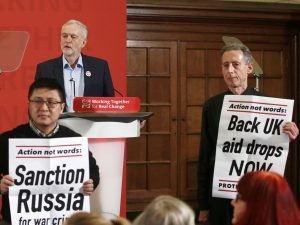 On Saturday, the human rights campaigner Peter Tatchell interrupted the Labour Party leader Jeremy Corbyn’s speech about domestic violence against women on World Human Rights Day – which in itself was an ironic act. Corbyn was about to speak when the Syria Solidarity UK protesters, led by Tatchell, took to the stage to protest. Tatchell alleges that Corbyn hasn’t done enough about the situation in Aleppo, with the Labour leader failing to speak out more to demand British air drops. 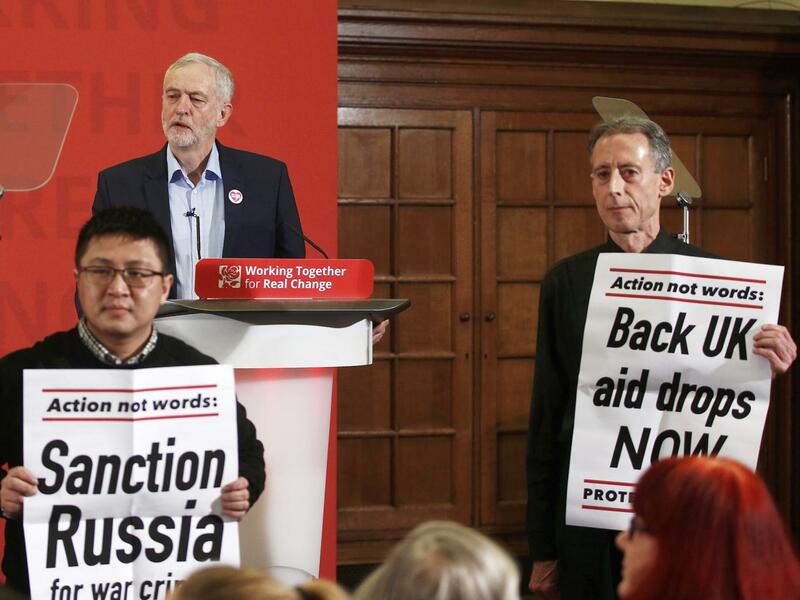 Meanwhile, Tatchell held an “actions not words” poster. The last time I checked, Corbyn wasn’t in government. What has he got in his power, apart from words? Tatchell and others say they want Syria suspended from the United Nations, so why not take the protest to those who have the power to do this like the sitting UK Government? And why weren’t the demonstrators also gathered outside the Russian Embassy on Human Rights Day, voicing their criticism of Putin’s involvement in Syria, or at a Conservative Party event protesting about Aleppo? Instead, they decided to raise questions about Syria with the opposition leader while the cameras were rolling. You don’t have to be a banner-waving Corbyn supporter to realise that Tatchell’s actions were both wrong and misguided. Corbyn has consistently been on the right side of history on matters of human rights, fighting social injustices and inequality. He is one of the very few politicians who has spoken out about the dismal situation in Syria and the West’s failure to resolve the conflict humanely, which made the protest utterly futile. As a gay activist, I have friends who are close to Tatchell and I admire his tireless work as a campaigner. But just because he has done some peerless work fighting for LGBT rights doesn’t mean all protests he makes should have impunity. 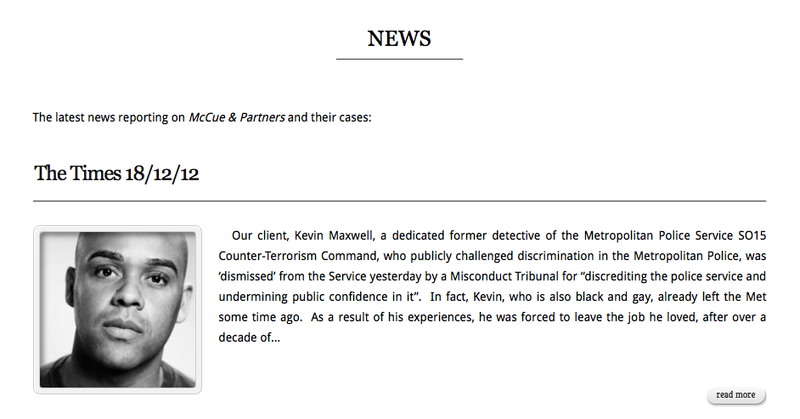 On this occasion, Tatchell made a poor decision. It’s exactly these kind of opportunist stunts from the so-called Left which give rise to the likes of Ukip. The further reaches of the right in Britain don’t need to expend their effort attacking Corbyn when others are doing their work for them. You need no greater example of this than those in the right-wing press applauding Tatchell’s actions. I cannot see what Tatchell hoped to achieve by targeting Corbyn in such manner, interrupting his important speech about violence against women for failling to oppose a war he has made clear he absolutely opposes. It is baffling. What I saw Saturday from the Labour leader was a calm and dignified man being publicly embarrassed while national TV cameras rolled. 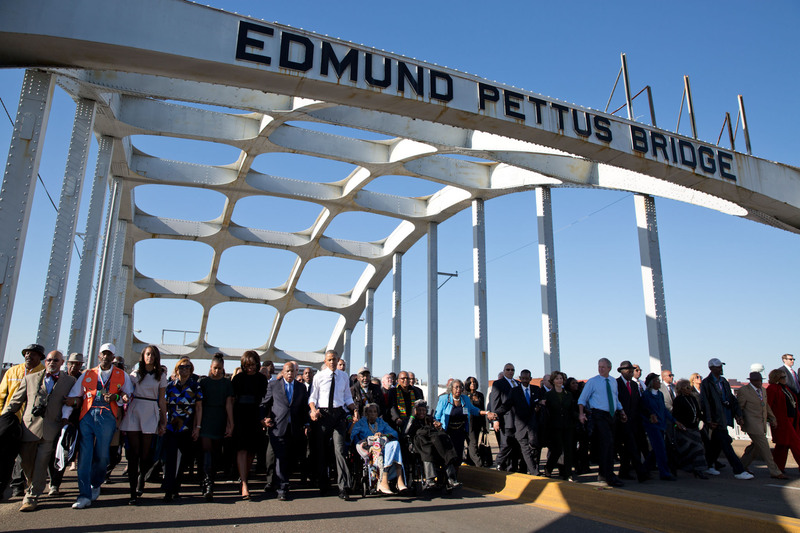 He handled the situation with patience and even thanked the protestors for “raising the point”. How many of us would have been so graceful in such circumstances? After coming out, I read an article by Tatchell in Gay Times in which he wrote that “shock tactics are sometimes necessary in order to expose injustice”. I agree – but what injustice had Corbyn committed here? All Tatchell achieved was the undermining of an event aimed at raising awareness of domestic violence against women. That is no victory, for Syria or for himself. Published by The Independent on 11 December 2016.